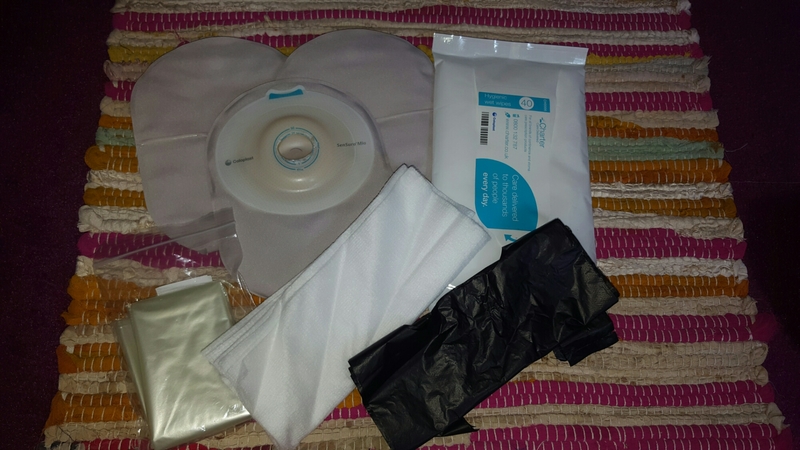 The products that I keep in my ostomy supplies bag. Well that and things have changed since I first posted about them also I organised the crap (haha!) outta them. Dont get me wrong they NEVER stay tidy for long I’m not a particularly tidy person to begin with! But 4 months in as an ostomate I’ve learnt what works for ME and if I do something that could make someone else’s life easier then I’m all for that. So I only keep a small amount of each item in my actual bag. Barrier rings I like the Dansac and the Coloplast ones best. Tape extenders I’m still not 100% taken with these yet but I’m going to keep with them for now. 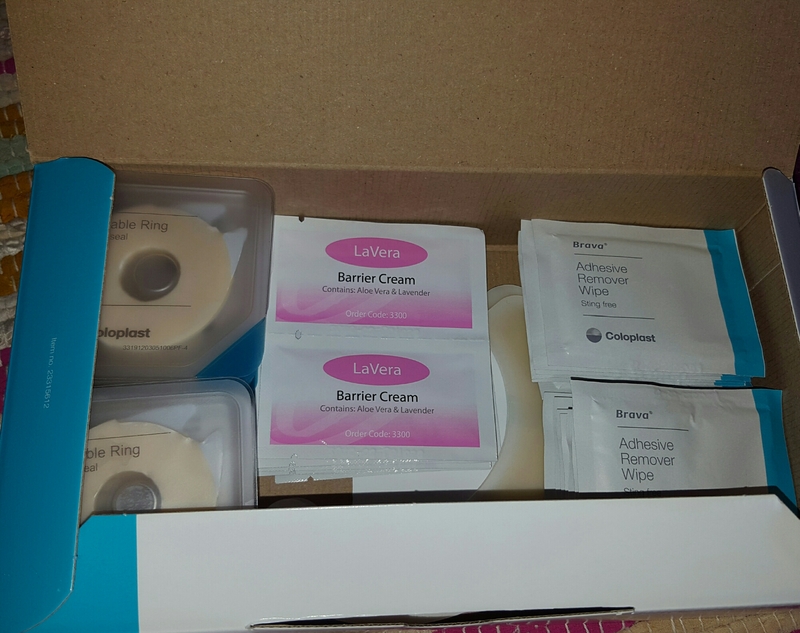 LaVera barrier cream, I became mildly allergic to the barrier sprays so my stoma nurse gave me this. You only need a little, let the cream dry before applying your bag. My tip is to keep massaging the cream in for a bit. 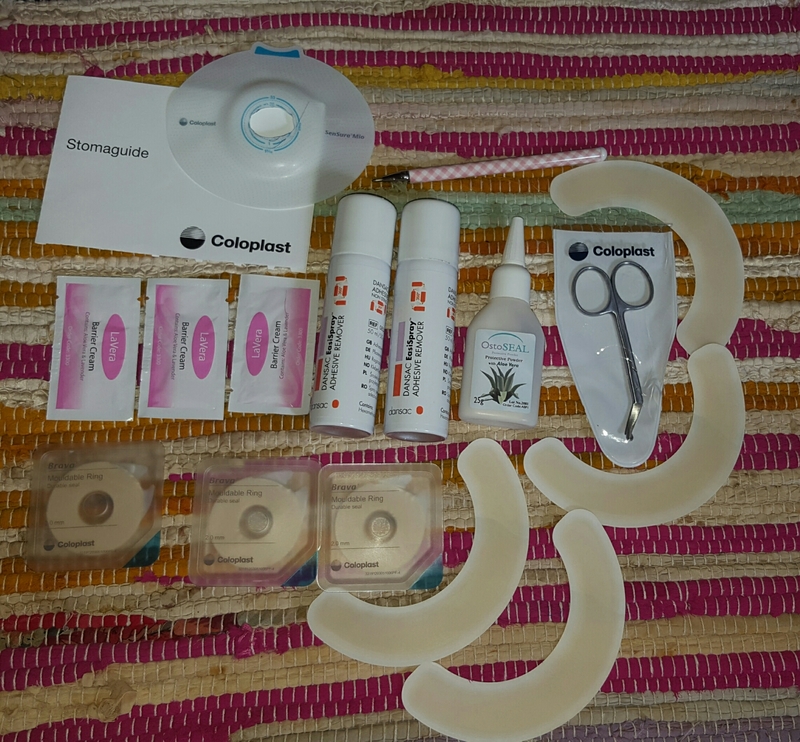 Coloplast scissors or any curved nail scissor for cutting your bags. 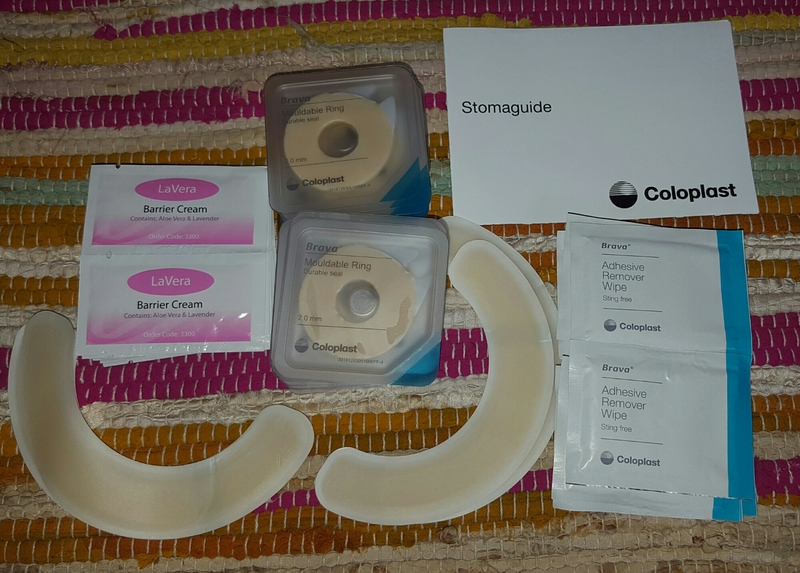 The Coloplast ones have a rounded tip which stops you cutting a hole in your bag. OstoSeal powder or any powder for stomas. I put this directly around my stoma then tap off. I can tap it off because I’m not very slim at the moment and my tummy jiggles it off. Adhesive remover. I do prefer the spray to the wipes especially when using the extenders. A stoma size guide. I tend to size it every fortnight unless it’s been uncomfortable. Then I get 00Steve to cut out a few new bags for my supply/ go/ handbag bag lol. A pen. Never underestimate the usefulness of a pen. If I cut my own bags out whilst the stoma still matches I just use my biro and chop away. A template. Now I always keep a template of a bag that 00Steve cuts I just know then it is right. He works in mm everyday so I just know they are right. Also a belt. Make sure it’s the right belt for the bag you are using. It’s not pictured because I’m wearing it lol. Precut, already closed bags. Now I don’t worry I will forget to close my bag but if it decides to be active once the bag is on but I’m not finished. I don’t want it allover my feet and the bathroom floor! Dry wipes that are woven not tissue. These are handy as you can tear them in half which makes them last longer. Wet wipes. I just recently received these in my last delivery and I can take or leave them. 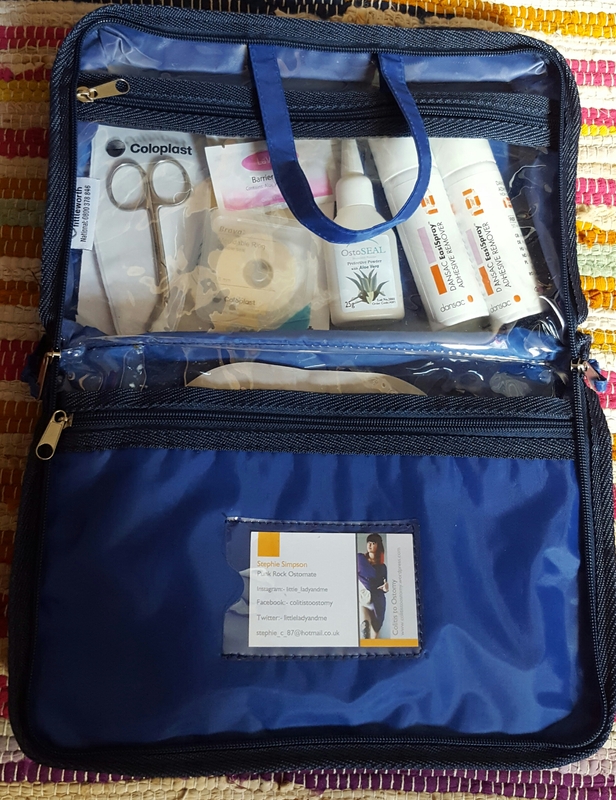 But they are handy if I need to do a bag change asap and the bathroom is in use. 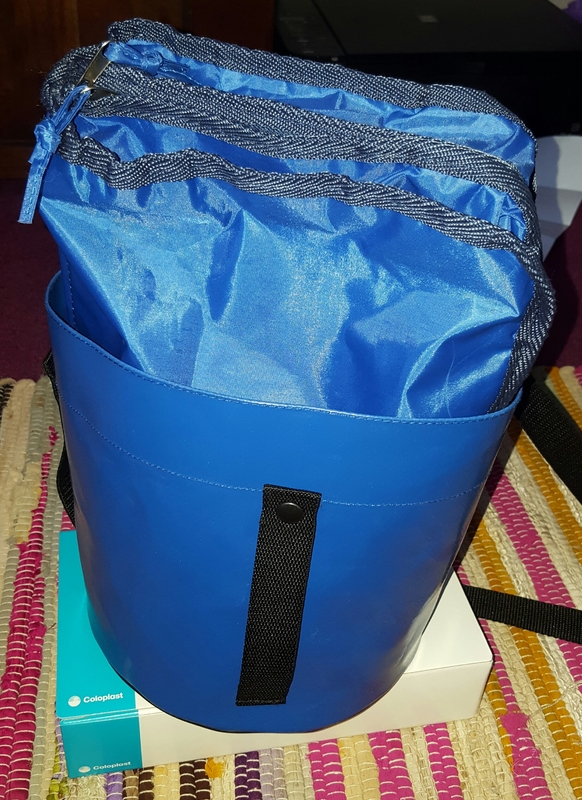 I received some water soluble or biodegradable (I forget which) bags with my Riksack which I still use. I don’t have to but it gives me a bit of security. I have them in there as a just in case. Normal disposable bags. I always have at least 2 since they have to be double bagged here before going in general waste. Look at the neatness LOOK AT IT! Please as it won’t last! Also I hated not having anything in that slot do bam! blogness card to the rescue! I also find reusing one of the boxes the bags come in for having some of the little bits all in one place quite useful. Plenty of space for other bits if needed. Then on my shelf I just stack them like this. The supply bag slots inside the Riksack and that in turn sits on the box. Then boom! tidy and space saving. Do you have any tips that cold help someone else? Comment below.